Artistic Touch Dentistry wants to share new research that has been conducted by lead scientist, Paul Sharpe (the Dickinson professor of craniofacial biology at King’s College, London) that may allow you to grow a replacement tooth from your own cells in the future. “While this research is still to early to test on people, the technique involved uses stem cells and growing more of them to produce a very small and immature tooth. This tooth would look similar to a tooth when it starts to grow within the embryo,” WebMD reported. Although this technique using stem cells to make a tooth replacement would be a huge step forward in dental surgery, it is not likely that scientists will be able to grow a certain type of tooth. Currently, when you need missing or damaged teeth replaced you must use a fixed or removable dental implant. While this technology is still in the early stages, dental implants are one of the best treatments to replace teeth. They provide you with teeth that look, feel, and function like natural teeth. With dental implants, you can smile with confidence and eat anything you want without having to worry. Dental implants are tiny titanium posts and they are placed into the jawbone where your teeth are missing. Your bone bonds with the titanium, which creates a strong foundation for your artificial teeth. 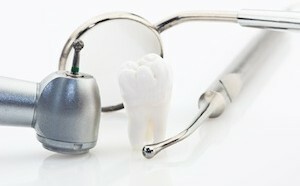 Dental implants are changing the way people live! With them, people are rediscovering the comfort and confidence to eat, speak, laugh and enjoy life. When you are looking for dental implants then give Artistic Touch Dentistry a call to schedule an appointment.